Southwestern Native American tribes use a variety of vibrant natural gemstones in their jewelry. Each stone has its own unique characteristics, as well as a spiritual meaning. 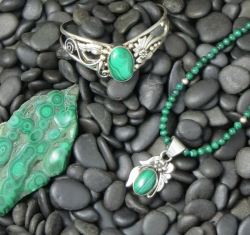 The most popular stone used in Native American jewelry, turquoise, is considered to be a symbol of life, and is believed to have healing properties. 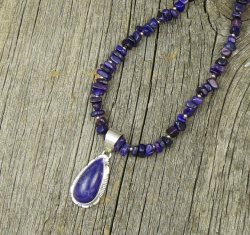 In addition to authentic turquoise pieces, Southwest Silver Gallery also offers an array of real gemstone jewelry featuring lapis lazuli, amethyst, coral, malachite, onyx, sugilite, and spiny oyster shell. 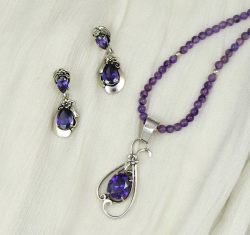 The natural stones used in our real gemstone jewelry are both beautiful and meaningful. 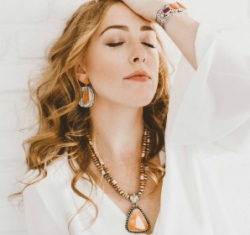 The vibrant red hues of coral represent power and speed to the Zuni tribe, while lapis lazuli is meant to bring awareness and focus to the wearer. Brilliant green malachite is the stone of transformation, violet hued amethyst brings out the creativity within, and stunning black onyx banishes grief and encourages happiness. Discover the wonder and spirituality these precious stones represent for Southwestern tribes, and bring some Native American tradition into your life. The stones in our real gemstone jewelry are legitimately sourced from local tribes — never imported. We are proud to feature the beautiful culture and history of Native American mining and precious gemstones. At Southwest Silver Gallery, we work only with expert craftsman from local Navajo, Zuni, Hopi, and Santo Domingo tribes. Most of our pieces are signed by the artist and come with a certificate of authenticity to guarantee their legitimacy.